Simple. We do this using 4 methods. 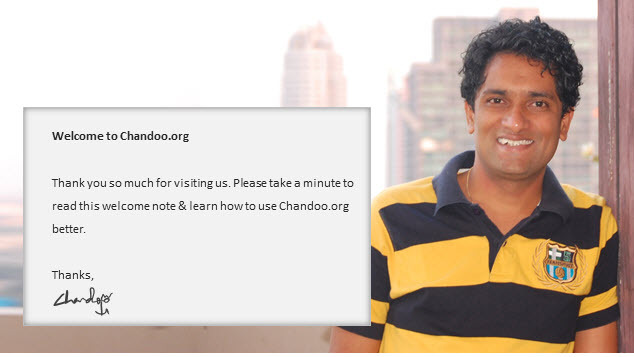 Although started as a personal website back in 2004, after 8 years, Chandoo.org runs on a small employee force (4) and massive volunteer community. Hui: contributes voluntarily to our site as a guest author (60 posts, 1,000+ comments), forum member (3,500+ posts). Lives in Perth, Australia with Eva (wife) and kids. Vijay: manages our online VBA classes, contributes occasionally as guest author, forum member. Full time employee of Chandoo.org. Lives in Delhi, India with Anita (wife) and Ashwin (son). Sameer: answers student questions on Excel School & VBA classes. Employee of Chandoo.org. Ravindra: manages student admissions to our online courses. Helps me with phone and email answering. Full time employee of Chandoo.org. Lives in Ongloe, India. While we are not as social as Paris Hilton, we do have a sizable presence on latest web fads. Click on below links to connect with us on your favorite social media platform. Keep up the good work! Definitely I am your regular reader (settled in Bangalore, India but presently residing in Jeddah, Saudi Arabia for a business trip). I am watching it everyday since last 5 years. Awsome indeed. I am watching it everyday since last 2 years. I am once again glad to see your interest in introducing yourselves again to the world. The way it was framed is awesome. By the way - i have a question for you - to enroll for Excel for Project managers is it necessary to be able to be done with Excel school & VBA Classes. Chandoo, this is a great post. I have been following you for over two years, but this post has heaps for me. The indexing to your various types of posts is terrific. I will keep this as a reference to help me navigate through all the amazing information that you have on Excel. Chandoo, I love visit your site and I would like to tell you that your work is outstanding as well as the way you share your heart and your workbooks for free with everyone who needs to learn Excel but can't do it for lack of resources. Thank you so much for everything you do. That was an wait for it...... awesome introduction to your website. Your open heart and personalized approach is really cool. It strikes chord. God Bless. Keep growing, Help growing. Thanks for web page. I have a problem to vlook up. Suppose we are providing donation for different state of nation either once a time or more than one time as name of state. State must have repay to central government of that donation amount. In this regarding I need grand total donation amount to different state and their state wise status (outstanding donation= Dr donation- Cr donation). Please let me know how it should entry whether I want to post once in single workbook. I would be really appreciate for your kind cooperation.